I hoped she would tell me the origin of one tradition that has been part of the celebrations in my own family for as long as I can remember. Every New Year’s Eve we would put a plate on the table in hopes Santa would make a return visit on his way back to the North Pole. (In those days Santa’s sleigh wasn’t jet powered and the trip around the world took a week.) In the morning my brothers and I woke up early, but not quite as early as Christmas morning when anytime past midnight was acceptable. Once awake, we rushed down the stairs to see if Santa left anything on our plates. There’s a woman I met when I was a child who has been a tremendous influence on my life. Was she rich or famous? No, not at all! 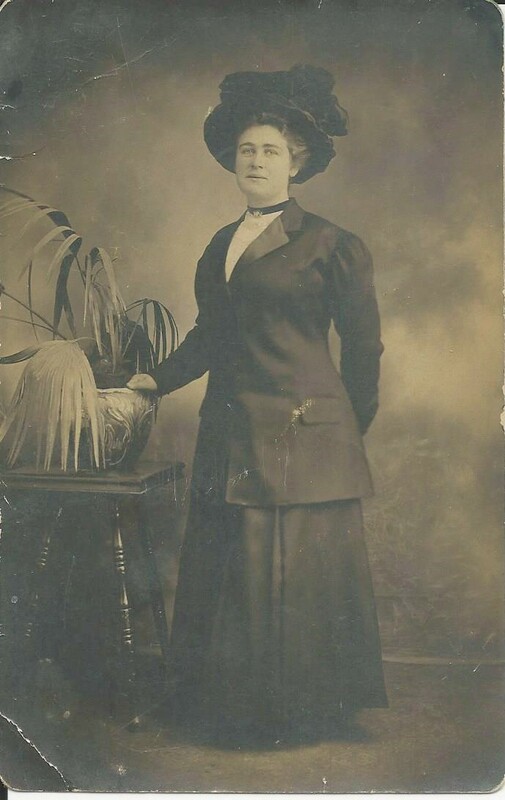 Sarah Maude, my great grandmother, lived on a tiny island in a small, neat house with no electricity or running water. Her husband, Caleb, was away from the family home for several months of the year, leaving her to take care of their eight children. In her lifetime she travelled little except to follow the dirt path that led to the school in the middle of the village or make her way to the church in order to worship God. Unfortunately, Sarah Maude died before my fifth birthday and shortly after this I also moved away from my home island so for a number of years she was only a name in a long list of relatives. However, I was able to renew her acquaintance when, a few years ago, my mother gave me an old suitcase filled with newspaper clippings, poetry, old songs and pictures that had been left behind after her death. While hunting through these scraps of yellowed clippings, I began to gain a mental picture of my great grandmother. In the suitcase, I discovered tender letters Sarah had written to her children and I read of the grief she felt when Irene, her second daughter, died just days before her wedding and Wilfred died of heat stroke in the First World War. One newspaper clipping told of how the whole community was saddened when Caleb, her husband, and Charlie, her youngest son, died on the same day. But it wasn’t how great gram handled death or overcame her financial difficulties that has been the biggest influence on my life, it was the stories shared with me by her children and grandchildren. “I know what it is,” Sarah beamed at her son. “You have made a decision to put God first in your life.” My great grandmother had guessed her son’s news and together they prayed and thanked God for her son’s commitment. The evening was filled with much rejoicing but later when her youngest daughter was tucking her into bed, Sarah told her, “I feel all boarded up inside.” She had prayed for her son until he was nearly fifty-seven years of age and now her work on earth was done. She closed her eyes in sleep and that night God took her home to be with him. Sarah died many years ago, yet she’s taught me the importance of one mother’s choice to live a godly life. Her prayers were like the circles a tiny pebble makes when thrown into the pond and the circles from Sarah’s prayers have been ever widening. They have reached down through generations and are being used by God to bring her children, grandchildren and her great grandchild, to himself. Today I went walking with a friend, and as we walked, we talked about our mutual acquaintances and discovered we had some of the same relatives. When I returned home from the event, I looked up a small black book which had been given to me by a family member several years ago. The book, not remarkable except for the gold stamped letters on its cover, Diary, 1870, had the owner’s name, Walter McLaughlin, scribbled on the first page. At the time of his writing, McLaughlin was serving as a Federal Fisheries Officer, one of the first appointed after Confederation. Born in 1829, McLaughlin served as the keeper of the Gannet Rock Light at the mouth of the Bay of Fundy from 1853 to 1900. His home was in Deep Cove, on the lower part of the island of Grand Manan. Probably because of his connection to the sea, the first entry on every page consisted of a notation about the weather and the sea conditions. In 1870 the residents of southern New Brunswick were enjoying a mild winter. The local fishermen were reporting bountiful catches and sightings of pods of whales which had followed the herring up the Bay. In 1870 Canada, as a nation, was just three years old and a diary written by Walter B. McLaughlin, a lighthouse keeper, gentleman farmer, politician and one of our nations’ first fishery officers tells a fascinating story of life on Grand Manan Island, New Brunswick. January 1, 1870 – A quiet at home day. Walter spent part of the morning studying the Word of God, then and in the evening he went to a Templer Meeting. He wrote of going early to the evening meeting to light the lamp and build the fire to keep people warm. He wrote of missing his “dear son,” Woodward, who was away studying in Malden, Mass. Apparently they were having a mild winter for by January 3 the frost was out of the ground, mud was everywhere, travel was nearly impossible. The herring was in and the fishermen were pleased with their bountiful catches. Fishermen and merchants in other vessels were coming alongside the island fishing boats and purchasing their catches. Whales had followed the herring and they were spouting everywhere. Daily life consisted of Chores, Chores, and more CHORES, many and varied. On this particular day Walter made out bills for the Marine Department. Later in the day he boarded the schooner FAME of Eastport and the OASIS of Cutler and told the captains “to leave these waters.” He’d found the decks loaded with fresh herring caught the previous night. In mid-January Walter planned a trip to Saint John. He travelled up island and stayed in a rooming house at the Bancroft’s overnight, then left on the PACKET at 10.00 a.m. and arrived in Eastport five hours later. While in Eastport he stayed with his sister, Julia, her husband and his little niece, Nell. A lot of Walter’s spare time is spent at church. While in Eastport he “attended church to hear Brother Pepper preach then went to a bible class and a prayer meeting.” The next evening he went to a “sociable” at John Stephen’s with his sister. He wrote, “Had a pleasant evening, met Major Andrews from the U. S Army. Although his plans were to travel to Saint John, he still wasn’t there yet even thought he had been on his way for several days. Enough time has elapsed that he has had mail delivered from his wife by the Cale Benson’s vessel, HORN and sent mail back to her by George Benson. On January 26, he boarded the PACKET at eleven in the morning and arrived in Saint John sixteen hours later. After settling in at the boarding house Walter looked up his old friend Rev. Barnes who was moving to a new charge in Oromocto the next day. Walter was in the city on fisheries business, making reports and settling accounts. However, like most Grand Mananers who come to Saint John, he had his shopping list. He took five hundred dollars out of his bank and went shopping for – a new stove, an iron axe, a lamp whistle for the light house, two trunks, etc. He wrote he spent $1.90 to purchase a dress for his wife, $1.80 for a new axe and $5.00 to ship his goods home to the island. (A total of $6.00 was spent for his fare to Eastport alone.) It is interesting to see the names of some of the books he purchased for himself and his family. Some examples were “Double Play by W. Everest: King George’s M? by William Gilbert; and “The Brownies and Other Tales” for his children. After a ‘duck’s rest” he left the Waverly Home Walter boarded train cars in Fairvale, (West Saint John) and started his journey home. His first stop was in St. Stephen where he visited with a cousin, Mike and attending church services at the Milltown Baptist Church. On Monday he set out on his journey only to find out, much to his disgust, that he had lost his passage on the River Boat due to the “rascality” of the Inn Keeper. Five days after his journey started in Saint John, Walter once more boarded the PACKET and this time arrived on the island in the early afternoon but he still wasn’t home. The roads were drifted in and impassable so he spent one more night in a different bed, this time at the Drake’s home. Early the next morning he started walking home and it was dark when he finally arrived. More chores were waiting to be attended to at home. More sheep had been lost by drowning. The horses needed to be taken to the blacksmith and re-shoed for the total of “one hundred and twenty-five cents.” The sled needed new runners. That bill came to four dollars, three for the runner and a dollar to pay Bill for a day’s work to put it on the sled. Hay had to be hauled for the livestock. When this was done, they had to take water by ship to the Gannet Rock light. In mid-March the ground finally froze solidly and it was now time to get the logs out of the woods. They worked hard until twenty-five cords were hauled out. Mid-March was also time for Woodward to return from Malden. Once Clara, Walter’s wife, felt well enough, Walter left for Eastport once more. After a visit with his sister, he boarded “the cars” again and made his way toward Malden, Mass. A storm delayed him for one day. Walter then boarded a boat at noon and arrived in Portland fifteen and one half hours later. Here he boarded “the cars” and took an enjoyable trip through the villages of New Hampshire and then to Malden. Monday: Went over the town with Daniel.- Visited factories – Attended a Town Meeting where taxes and the Twine question seemed to be the big discussion items. Tuesday: Went to the city to visit the State House. Saw old battle flags, a canon taken in the Revolution, a bust of Daniel Webster. Took dinner at the Coplands’ and paid $ 2.10. Wednesday: Went to city with son Woodward and sister Ellen. Visited the Museum where they had the 3 – B tour” . . . wild beasts, busts of old heroes and battle scenes. Thurs: Visited Boston Common – Saw Statue of Washington – Went to a library. Friday: Visited Charleston – Toured the Navy yards – Saw immense guns, workshops, big ships’. Saw the ship VIRGINIA on the rocks where it has been for 58 years. Saturday: Went to Bunker Hill. Fine view of Boston – Saw where war men fell when running from our Soldiers. Had dinner at a restaurant, visited Mrs. Smith, “old Mr. Whipple and then to the Widow Chapman’s. Monday: It was now time to say their goodbyes and leave for Grand Manan once again. Woodward had not been home since November the previous fall. They took cars for Boston and then boarded the steamer New Brunswick. They had to lie by the wharf all day. The boat didn’t leave until five the next morning. It was fortunate that they were able to rent a stateroom and was able to get a comfortable rest. Eleven hours later, they arrived in Portland, Maine. After letting off and picking up passengers, they left for Eastport an hour after they had docked. This was not a pleasant trip for there were head winds and heavy seas running. Unfortunately, most of the passengers were sick. Twenty four hours later they arrived at Eastport. Here they experienced yet another delay in their journey. The PACKET had left for Grand Manan in the night without notifying McLaughlin that they were sailing. They missed their boat! That meant another week of putting in time while they waited for the gales to subside, the snow storms to abate and the breezes to slacken. Finally on the seventh day of delay, they boarded the ship INDIA and made the final leg of their journey to home adding new meaning to the saying Home at last! It was while taking his turn on Gannet Rock that Walter had time to catch up on his rest and reading. After chores, checking the light and playing with his sons it was time to settle in for a time of reading. Wilfred is the middle child in the back row and his brother, Hughitson is the boy on the far right. I received your letter last night and will make it my business to answer it at once. I will tell you about Wilfred first and me afterward. We haven’t found a teacher for the advanced school yet. They thought they had one engaged but she couldn’t get a boarding place with a piano and bathroom so she wouldn’t come. They have advertised again but I expect it will be hard to get one now. Carry says that if there is many herring comes in he will have to camp out to string as stringers will be very scarce. However, if we get a teacher and I am home, I would be willing to board Wilfred if he can put up with our way of living. I guess he and John would get along all right. So I guess there would be no trouble about his coming. About board, I don’t know what to say. I never boarded a boy so don’t know what it would be worth. Willie Ingersoll gets board for 1.50 and Warren Bray for 1.75 but I couldn’t charge you more than 1.25 with a clear conscience. Do you think that would be more than it is worth? Now for news. I don’t know as there is any for I expect you get letters from home telling you what little there is to tell. Gladys Foot has got her boy at last. I was over there when it came and the poor wretch wasn’t sick a bit. She didn’t open her mouth to make a fuss at all. The baby must weigh near 12 lbs, has brown hair and dark blue eyes, a small nose, a round face and a big mouth. He’s not a bad looking boy and as well and strong also. So much for him, now Gladys. She was taken sick a week ago Sat. night and her baby was born Sunday morning. She got up out of bed Tuesday and went home today and carried the baby so you may know she is some relation to the Indian tribe. Some of the men are taking a few herring. They have had a day’s stringing off here this week and got a few more today in the Jack Tar and Hardwood Cove weirs. I have been picking berries to sell and doing anything I could to earn a cent. I came pretty near going to Black’s Harbour. The herring just came in time to save me the trip. I heard yesterday that the cook and Leona Benson and Fletcher Harvey were going to leave the station and that Orland Joy, Hughie (Shepherd) and Rue Ingalls were going to take their place. I don’t know how true it is. Thomas Hartt is going to speak here tonight. I suppose it will be nothing but political meetings again but I expect it will be hard to get to one now. worked for a hatmaker one time and I love the story I discovered in a letter written to my mom that addresses this love. Gladys Wilson wrote in January, 1980: “I’ve just been to my doctor’s for my check up and I wore my favourite hat, the one I acquired from your aunt Al some thirty-eight years ago. Years ago when I lived on Wood Island, Al borrowed a cup of flour from me. Later, we met in Black’s Harbour and your aunt was sporting a new hat which I admired very much. I told her how attractive the hat looked on her head. What did the people of the island read one hundred years ago? According to the History of Grand Manan XIX, the book LIGHTS and SHADOWS by Rev. N. Barnes, the Bible and THE WRECK OF THE TITANIC were the most popular books. In some cases, these were the only books available to read in many homes during the difficult days of World War One, consequently they were read many times over. After reading the above note, I read Rev. Barnes’ book and saved the following stories and quotes to share. “I went to the Conference, trusting that God would guide me aright, in reference to my work for the incoming year. I felt that I should go to Grand Manan on a visit, and if the people thought favorably, I would remain for a time. I took the steamer at St. John for Eastport, but had to wait there three days before I could get a passage to Grand Manan. I left Eastport late on Saturday, arriving at North Head, Grand Manan about daybreak the next morning. On the Sabbath morning, at the close of the service, I had my first baptism on this Island. There were three persons, two men and one woman, all married–James Benson and wife, and Henry McDonald. A short time afterward the keeper came off to the meetings and very soon both he and his wife gave themselves to Jesus. For upward to forty years this same keeper, Walter McLaughlin, was one of my dearest and most valued friends. On New Year’s Day in 1863, we sought to get the school house at Grand Harbour, in which to hold services, but were refused, as it was not finished. After a time a school committee meeting was held, and action was taken which closed the house against us forever. On that day the people rose up in their might and said, “We will build a meeting house,” and two hundred dollars was pledged on the spot. During the following summer the house was erected and nearly completed. From Grand Harbour I went to Wood Island, where for years I had been much blessed in my work. A goodly number of old people professed faith. One old man, by the name of Green, eighty-one years of age, and suffering with a cancer in his face and loss of sight, was baptized with the assistance of Deacon Samuel Harvey. This baptism was only possible by placing the old man in a chair. It was a most solemn service, and by it others were led to follow most gladly. (Aunt Lila’s foot note to this was that this was her Great Grandfather, William Green. She assured me that she had been. I felt sure I must have misunderstood her, but she assured me that I had not. In then asked her to describe her baptism. “Well one day, many years ago, when we lived at Deep Cove, I was standing by my husband’s boat, when a great wave came and catching me up, carried me out into the bay, rolled me over, and then brought me back to shore again.